FOR A LIMITED TIME: ADD AN ENGRAVED MARK ON YOUR UC35 V2.0 FOR FREE . Notice: Parameters lab tested with a Fenix ARB-L18-3500 18650 battery and may vary between flashlights, batteries and environments. Note: The low-voltage warning only works with rechargeable Li-ion 18650 battery, not with disposable CR123A’s. Turn off the light. Plug the USB side of the charging cable into any USB power supply. Uncover the dust cover of the light, and plug the Micro USB side of the charging cable into the charging port of the light. The battery level indicator displays red while charging and turns to solid green when charging is complete. The normal charging time of the included Fenix ARB-L18-3500 is about 3.5 hours. Once charging is completed, be sure to remove the charging cable and replace the dust cover to protect against dust and foreign objects. Excellent brightness. Recharged quickly and easily. Fits in my pocket with no problem. Great purchase! Light is great but the holster lasted 1 week! This flashlight is great! A good flashlight is a mechanics best friend…. Can also be used as a hand warmer in turbo mode! Does heat up pretty good but does put out a lot of light. Better than I could have hoped for. Light stopped working 2 weeks after purchased. Hi Vincent – I will have someone from Warranty reach out to you. Light weight, quick charging, and VERY bright! I love everything about the UC35 V2.0! I had a Fenix before and love it so I had to orde me another one for work and use my older on at home. Battery would not hold a charge. Had to mail battery to warranty department, before I could get a replacement battery. That’s a lot of trouble to put a good customer like I am, I own several of your flashlights. Still haven’t received battery. Flashlight dead! Looks like there was miscommunication in warranty with someone asking you to send in the battery first, and I’m sorry that happened. Hopefully it lasts a long time. 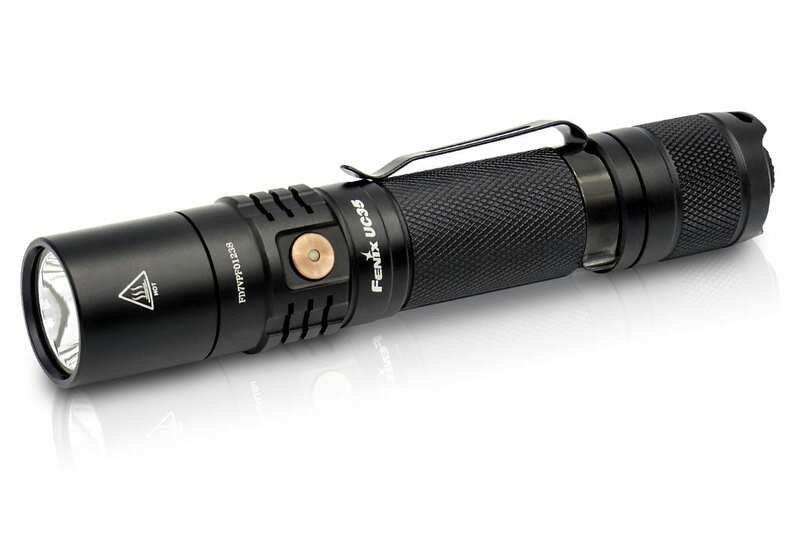 I had high hopes for this flashlight, but it’s real-life performance is not without issues. First of all, it’s great that it’s rechargeable, but that little rubber flap covering the port is not well-designed — after just a two months of weekly use, it no longer closes properly, and I expect it will soon break off, leaving the port exposed to dirt and dust. Also, the cord’s charging plug should’ve been made “reversible design” to fit the port without having to put one side up or down — trying to correctly fit that 1 cm tab into its 1 cm slot while pushing the rubber flap out of the way is surprisingly tricky! Secondly, when the charge gets low, the flashlight automatically reduces its power regardless of the setting you select — you put it up, it goes down, you put it up, it goes down — very frustrating. Thirdly, the button that adjusts the power-level should be more tactile, and easier to find blind — the texture of the ring around that area makes it challenging to locate the button quickly. Other than these design flaws, yes, it’s very bright — often too bright at the highest setting! And too big a step-increase between the first and second setting — if you’re working with or near reflective surfaces, sometimes, less is more — and super-bright can be blinding. All in all, this flashlight was expensive for what it delivers. Little Expensive, but high quality!! Simply the best flashlight I have ever owned. Period! Won’t buy another cheapo again. I think this flashlight with1000 lumens is perfect for what I needed to do at work. However I gave it a 4 rating because I would like to see this flashlight have a zoom in and zoom out on the stream of light itself. Other than that I work nights and it does everything I needed to do, it’s a solid flashlight. I love the fact that I could charge this flashlight via USB that is the best feature. This is one of the best lights I have ever carried. I will never leave home without it. Great size, very happy I chose the rechargeable version. Works on high power all day, and just plug it in at night. I have been around flashlights all my life–my father worked in management in two companies that made lights and batteries. This Fenix is the best light I have owned. It may be that there are better ones, but for standard consumer use I have not encountered them. I like it that I need not cycle through all the settings to return to the last used. I have used the moon setting and find it useful to leave that set at default. But there is real power when and if I need it. And I like the battery indicator feature. The small size also is a plus (compared to those lights of old). Only flashlight you will need. This is probably the best value around. Very high quality flashlight. The beam is a perfect mix of flood and spot. Really lights up the night! is the best I can’t wait to get a rechargeable headlamp thanks FENIX!!!!!!!!!!! Well built flashlight worth the money. Very good bang for your buck, durable, small enough to comfortably carry in your front pocket (the metal clip makes that easy). It has a focused beam that is relatively small at close distances (not a good or bad thing necessarily, just depends on your application) with accompanying flood lighting. Love that I do not have to cycle through the settings every time I turn it on. It turns on at your previous output setting. I love the flashlight, but after charging it the battery would loose its charge. Had to replace it within a week. Hi Denise – sounds like a bad battery – I’ll have warranty reach out to you. This is my 3rd purchase from Fenix, very pleased with the products. Definitely a quality flashlights, something as a union Boilermaker working in power plants is a must. A very good light. Love the on off with set button. Very nice flashlight! Bright and easy to carry. Works great. best flashlight on the market for the price. The UC35 is a great flashlight, just as bright as the UC30 I have used for some time. The addition of a tail switch adds functionality. The brightness level button is a bit more difficult to find in the dark than the one on the UC30. I am trying aligning the pocket clip with the button to give a reference point. The rubber USB port cover is more difficult to close and seal properly. The cover on the UC30 is better, in my opinion. Aside from these issues, I am pleased with the light. Best Flashlight that I have ever used. Very satisfied with it..
Love it super bright , built tough , light weight , and battery lasts forever best investment I have ever done. Definitely will be getting more products here. Fenix has always provided excellent products. This one is awesome. Easy to use, sturdy, bright, compact. Outstanding flashlight. Solid construction and powerful light. Great battery life and a powerful light. This light is great! Light weight, small frame and the optional brightness is great. I use the lowest setting for writing reports, medium settings on traffic stops and searching cars and the brightest to check perimeter. Definitely recommend this light. Battery lasts a long time between charges. I knew what I was buying so will not give this sweet light anything less then a 5, I only wish the beam was adjustable, maybe the 3.0 version. Hint Hint. Outstanding flashlight. Extremely bright for its size. Great flashlight – works really well. I like how long the battery lasts, compared to my other Fenix flashlight with the 2600 in it. Well built light and no problems so far. Super bright. The belt pouch could be a little better though. It’s already showing wear marks after a couple weeks. Also USB charger port cover is way to tight and nearly impossible to perfectly close. Hi Dan – I will have someone from warranty contact you about this. Very powerful, love the tail switch and range of lumen choices – one of the best lights I’ve ever owned. Highly recommend these over any other brand. Good light. very light weight for pocket carry. CONS: the selector for the modes is a bit hard to find by feel alone. should be more of a stub sticking out. also near impossible to change modes with heavy gloves on. PLEASE FIX THIS IN NEXT EDITION. WANTS: Perhaps a sacrificial cover to place over the lens for those of us that use during maintenance etc. scratched lens is not possible to just change out. Also perhaps a version with adjustable spot to flood. This light is more beam centric/spot than most other lights in its class. Hi Joseph – one way to locate the switch is to turn the belt clip so that it lines up with the side button. Right pricy but really bright. The dark runs from it. Incredibly bright for such a small light. Very well built. This is an excellent flashlight, 100%. Good service. Good product. But The full mode in light isn’t holding for as long as factory suggests. 1000 lumens are getting dimmed after 4-5 minutes of use even with fully recharged battery. Gave as a gift to my brother and he loves it. This was a gift for my son, he is an engineer and loves it for smaller size, but not compromised light. This flashlight is amazing, portable, and extremely bright! I am glad to have it. Great flashlight once troubleshooting and everything tightened up. For almost $100 I expect it to work out of the box. The first hour or so I was ready to return. Intermittent light. No light. Regardless of what charger says give it multiple hours. Tighten all pieces. Small, compact, super bright and perfect for any industry! If you need a flash light its the one you want! Best pocket flashlight I’ve ever owned. I had the PD35 with a rechargeable battery and after a few years of daily use the light finally went out. I’m glad to see they now make the UC35 with a built in charging port. Although it takes more then 3 hours to charge from dead as stated in the directions, it is still worth the money. Only change I don’t like is the function selection button. The flat metal button feels just like the rest of the flashlight now which makes it really hard to find by feel. It needs a texture or something that can be found by feel alone. But I won’t compromise with any other LED flashlight that needs to be hit or taped on something to get the light to quit shorting out. My wife similar got me an off brand, but I told her I didn’t want anything different then what I had. The 1000 lumens alternating emergency strobe is awesome in cases of roadside or on road accidents to grab peoples attention. Even had an arriving officer want my PD35. And the new 1 lumen to 1000 lumen selection goes even dimmer then the older version for times when you need light but don’t want to wake anyone, and brighter then any however million candle watt spotlight I’ve ever owned. I will continue to refer people to them and be a repeat buyer myself as long as they continue making high quality products like this. Hi Jeffrey! One trick that might help to quickly locate the function button on the side is to rotate the body clip on the light so that it lines up with the function button – just a small way to know where the button is in the dark or when grabbing it quickly. Bought for use on a bike to replace an older model (E16 as I recall). This unit is much better because it is rechargeable and more importantly, a better, brighter more even beam. I can use on the second lowest setting and it works well giving me a long tome between rides but have not been able to test the time between recharges – I expect the published data to be correct of very close to actual use.. Two distinct beams. The center beam is bright and very even. The second beam is larger and a bit dimmer but still very even light. The center of the first beam is set about 15 yards ahead and is good for my riding speed (15-18mph) and is good for total darkness and when street lights are available. Width of the first beam is about 6 feet wide at 15 yards in front of me. Second beam provides a wider path (maybe 5 years width at 10 ft in front of me) adjacent to my tire’s path so I know the surrounding conditions. You can’t beat this company’s lights. Bought a single light and have now purchased something like 10 lights in a few of different models…. a VERY MERRY CHRISTMAS to all on the receiving end of things. Great light, LOUSY web site for registering the light’s warranty! Unfortunately the factory website has had problems with registration, however, when you buy through us you are pre-registered through your serial number. It’s an amazing light for its size! I keep this on my jacket pocket. Very powerful for its size. I’m a bit of a flashlight nut, I don’t tolerate the I adequate. Very cool! Super pleased with my Christmas gift to myself! Great output, size and value. The fact that it’s rechargeable is even better! Exactly as promised! First impression wasn’t very good – pushing the output selection switch would cause mad flickering and the light would stay at its lowest level. Later on, the switch somehow fixed itself and it now works, but I am concerned that this is going to be a repeat issue and is a symptom of cheap electronics (something I have seen before with a $3-LED flashlight from a local store). The output selection switch is hard to find in the dark, especially with gloves on, and is not practical at all. My other concern is with the rubber cover for the USB connector. I fear that it would deteriorate over time as it normally happens with rubber-made stuff. The Turbo mode doesn’t seem 3x brighter than the High mode so I wonder if the specs are accurate. Hopefully the flickering doesn’t occur again – typically that only happens initially before a full charge of the battery. So I would make sure the battery has a full charge, but if the issue seems occurs again with a full charge, please contact the warranty/repair department for help. Really like this light. Well made and easy to operate due to it’s tail switch. Recommended. Having quite a few of the V1 version of these, they hold up well. The new version is slightly smaller and brighter. I continue to outfit my teams with these lights. Best flashlight I have ever owned. Bought for my wife’s holdall. Again instruction leaflet hard to read. I truly loved this flashlight! I carry it everyday I go to work and use it daily, that is for the first two months. All of a sudden yesterday it quit working. Won’t even charge. Very disappointed in the longevity of this expensive flashlight. Sorry to hear that happened Jonathan. I’ll have someone in warranty email you. Unfortunately my flashlight was giving me trouble as it would show half charged after being taken off the charger and turned on. And the modes flickered ehen selected with the full battery. Even one of the replacement batteries did not fix the flickering. Finally got another light at REI and it was OK, so now I have a functioning light. Love the throw, but I would love a more floody small flashlight as well. Sorry to hear that Ralph – I will have Colt in Warranty get in touch with you to help. Very nice and solid little flashlight. I don’t know if the lumen output(s) equals the purported ratings but it is VERY bright at its higher settings. USB charging is very handy. Would be better if Fenix designed this with an option for a secure cradle mount charging contacts for the vehicle and a USB charging port for other location charging versatility. Fits in the pocket very well. 5 stars because it does what it says it will do very well. Love the brightness of this flashlight. Shape and size are comfortable in my hand. Buttons aren’t intuitive at first but I have figured it out now. I LOVE IT!! I’m involved in Play Productions and the Moonlight mode is more then PERFECT for what I need to do. Be it fixing a cable or reading the script to find out when actors come off stage so I can fix their mic, it’s even better Because I can shine the flashlight in their eyes and it won’t blind them!! And then the obvious option of having a bright light helps a lot as well!! I love it! This is my second flashlight from Fenix and I wouldn’t choose anything else! Great flashlight! Purchased several weeks ago for travel, to include in my roll-aboard, the UC-35 v2.0 flashlight fits my need for a light that has low power (“moonlight” mode) for red-eye flights, as well as multiple power levels up to 1000 lumens for use at my destination, when out and about, work, or hobby usage. Very Good quality, reasonable price. Thanks, Fenix. I love my flashlight. Its really bright and I can use it to see far away. Great build quality and functionality. Everyone in the family uses the light and wants to keep it for themselves which has never happened with a flashlight. Had some issues with first 2 sent to me. Fenix customer service was very accommodating. The 3rd one works excellent! Everything that I wanted in a compact flashlight. Turbo brightness setting is amazing! Battery indicator button popped off after 1 month. I cant use the strobe function anymore. Sorry to hear that – I’ve asked Colt in warranty to get in touch with you to help you on that. I have purchased 4 of these flashlights. One lasted about 8 months and fell out of my pocket while sitting on a bucket, now does not work. The other one the mode button fell out which they did replace. The next one just stopped working and sometimes does go on but wont shut off. The last one I have not taken out of the box yet. Two of them were Christmas presents. I guess I am going to be the Grinch. Hi Gary – look for a message from Colt in warranty to help out on this. Awesome light…well worth the price!! This is one solid flashlight that is quality built! Unfortunately I had already bought some of the other expensive leading brands (Streamlight, Surefire, etc) and each had their quality or option issues and a friend told me about Fenix and this is my new go to brand!!! I have bought several for work, home and every day carry. Not cheap but extremely reliable and I anticipate these will last a very long time. VERY bright, reliable light source. It’s my go-to for a zero fail flashlight. Lasts for a long time, easily rechargeable via USB. Can’t beat the quality, Fenix IS the bar. Love the size. It’s almost like having a mini mag flashlight in your pocket. The run time is amazing, even on the highest setting and recharges fairly quickly. Great light. This is my second one. Easy to carry and use. What can I say? A brilliant light, solid in it’s construction. I use mine on the job, every day. Never fails. I don’t go anywhere without my Fenix and my Leatherman. Literally, my EDC kit. If you’re a casual user, it may be a bit much for you, but if you’re a professional that needs ‘no excuses, no days off’ performance, this product was built for you. The charge indicator takes the cake. Sorry to hear that – I will have someone from our warranty and repair department contact you to help. Love this light! It is as advertised and perfect for my needs. Highest setting gets hot quick, but produces massive amount of light. I love the size, ease of charge, variation of settings, and brilliance of light. Wonderful product that I highly recommend! Great product, price and customer service The Apple of Led lights. As a home inspector and mechanic this is my favorite light by far with the settings, battery life, and perfect EDC light (for me personally) that fits in the palm of my hand. 11/10 Would recommend! This is a very nice light. Functions well and compact enough to carry daily. I gave a 4 as I do think it is a bit over priced but bought it anyway. I’ve had this light on my hip for about 2 weeks now using the included belt holster. Each level of brightness is useful, and has been used. The size is perfect. If I can’t see it is hard to index to the output selector button. I moved the clip to underneath to assist finding the output selector button. There are grooves on the body that can help index too. The tail button is longer than the guard so you cannot stand it up. An odd this is I charged for more than 4 hours and the led was still red. I tried the Samsung phone charger and an Anker intelligent iQ charger. So I don’t trust if I’m getting a full charge. I may get external charger. We will have someone from our warranty department contact you about the charging LED to see what’s going on. Great flashlight! I really like the adjustable lumens feature. I use the flashlight for law enforcement duties. Every bit as good of a flashlight as stream light…. Fast shipping, box was well treated, and light is awesome! Super bright and compact. It’s badass! Brighter light than my Surefire one for much less money and it’s rechargeable. Love it. Worked as expected. Great qulity. Small and bright with a nice indicator light on the side that tells you the charge level. Great for recreational use. The little smooth side button is hard to find and is frustrating to adjust brightness in the dark. Not tactical. If it had a better design, to locate the side button by feel, it would be the perfect small light. Nice and durable and, other than the side button, I like the design. Recharging it is easy and convenient! Light turns back on at same level as when turned off. A real plus. Bright little sucker. Great light, like the multiple setting and capability to use regular batteries. Just make sure you use a USB charger with enough wattage to get a full charge. Very pleased. Just what i was looking for. Well built, solid product. Everything I thought it would be. Hands down best flashlight ever!! Excellent customer service, excellent light. I now own three Fenix flashlights. Worth every penny! Great light, will buy another soon! Good light everything that I wanted and more. Great flashlight I also have a couple other models , Fenix is the best light I have used. Absolutely love it. Thought it might be a little big for EDC. Nope, just right!!!! Soon after receiving this UC35, I went on an extended backpacking trip in the canyon country of Southern Utah. It was used every night and banged-up pretty well while crawling through some caves and boulders. However, the light worked flawlessly and held a strong charge for the duration of the trip. So far, I have been impressed with the quality and reliability of this light. As bright as a car’s high beam, easily carried, and charges quickly. It does get hot quickly on the “turbo” setting, but not too hot to hold with a bare hand. This is my second one. I got V2 for the smaller size. V1 survived numerous drops and falls and being soaking wet. I had the LD20 for 6 years and a million drops off the ladder and it still worked. Finally the modes gave out so I upgraded to this one and the performance is amazing. I love that the on/off switch is separate from the mode switch. This light is super bright for a pocket light and the included 18650 cell is worth the price for this model and lasts a long time. The light is very good, very bright, but the killer idea is that the on-off switch is separate from the power controls. When I use my other flashlights the power changes every time I turn it on and off. With this flashlight I set the power level and the separate on-off switch gives me the correct power every time I activate it. High is 25% weaker than the PD35 UE from 2014 of 460lm! So less usable at high, and can claim 40 lm more for Turbo which is limited to a few minutes! High should be more like 600lm. So the upgrade here is more about marketing 1000 lm rather than an improved flashlight. The best and brightest flashlight I’ve ever owned. I’ve had it for about a month now and I’ve only charged the battery once with daily use. Powerful light and the battery charge lasts me about 5 days.Very satisfied. Brightest light I’ve ever had. Flashlight is a bit larger than I expected but is very well made. The dispersion of the beam and the color rendition are very good. The UI for the strobe is terrible. It requires you to turn on the light from the tail switch and then press and hold the SMALL switch on the side for a second or two to activate the strobe mode. Not very practical for a self-defense strobe feature. Too bad they couldn’t (or didn’t) enable the strobe to operate by pressing AND HOLDING the tail cap button in for, say, 2 seconds. This would keep the strobe mode active until the tail cap switch was depressed again. I am also a bit leery of the long-term life-span of the rubber seal around the charging port. Time will tell. The holster for this light is the cheapest and flimsiest of all of the flashlight holsters I have ever owned. Additionally, with a light this long, it’s a bit uncomfortable when sitting down. A horizontal carry option would be more comfortable. I have actually done this with a couple of strips of double-sided velcro. Really like the setting memory, compact size, and all in one package (light, battery, charger, holder). Great light. Use for maintenance work, and edc. Bright, lasts long. This light is powerful bright, and very well made! This is an extremely bright flashlight. The right size also. Great tool – well built, many options and easy to use. Great product. A little disappointed my order was delayed for some reason. Once Fenix was made aware of the situation, it was remedied quickly. The light itself is awesome! WHAT AN AWESOME FLASHLIGHT! Use it everyday and don’t have any complaints. pleasantly surprised at the quality and performance of this fine compact flashlight! After scrutiny, I was very impressed at the build quality and excellent features of the UC35 and unfortunately, so did my wife who used the law of Eminent Domain to declare this flashlight perfect for HER CAR! First flashlight that I have bought from Fenix and it has met my expectations! Love this flashlight. Small and powerful. With so many settings, u get the right light for every need. Easy to charge, can charge anywhere with the USB port. Won’t roll off table. Great light. This flashlight is everything I expected and a very good value. It is a well thought out product with great features. Works great. Real test will be coming this winter in the cold and dark.. This light is a little better than my UC 30. Wish I had bought the belt clip, too! Thoughtfully designed, sturdy and well made. Functioned as advertised. The two-button control is excellent & is one of the main reasons why I bought it. This flashlight replaces an annoying single-button design by a different manufacturer. As a potential upside, the option to adjust the focus more sharply would add to the overall appeal, which is still high without it. Very satisfied. I LOVE my Fenix!!! I use it in the garden at night, it’s so powerful and small. I like the ease of use and pocket size. it’s a decent light, but not great to me. the two brightest setting (1000 and 350) still not last long enough for me, the next one around 100 lumen is not bright enough for running on moderate technical trails. I need a light 1) compact 2) bright enough like 350 lumen 3) last for a whole night. Love the difference mode it has to adjust the light. Light weight. Battery seem to last a long time before charging it back up. One thing I died notice it does get warm when your on full power. Good flash light. Recommend to buy. I’ve had four Fenix lights and this is by far the best. Battery duration is great. Brightness is controllable. Size is perfect! Love this light! I do car checks on cars with 2.5% tint and with this light I can see through at the right angle with ease. Perimeter checks, welfare checks, vehicle checks you name it this flashlight is bright enough for any situation. My coworkers are always asking to borrow my flashlight because they can not depend on there own. My new UC35 V2 flashlight is very bright, easy to use, and rechargeable without removing the batteries. I’m very happy with it and the customer service from Fenix. Great light at a reasonable price! Super bright! Great quality torch. Love that you can plug in directly to charge. Superb quality. Compact and well thought out design. Highly recommended. I purchased this flashlight for work and I use it everyday. After researching and reading reviews I made the purchase. It is everything I wanted and haven’t disappointed yet. Great quality on the build and brighter than what I expected. light works great and i use it primarily on “high” mode to walk my dog every night. with the occasional switch up to turbo if i think i see some sort of critter. i use it 20-30 minutes per night and charge it when the light starts showing solid red. this takes about 8 or so days to get to. i really like the turbo light output but the unit heats up quite a bit in your hand in that mode. also i feel that 1k lumens is overkill for walking the dog in the suburbs. all in all it is a fantastic light! This flashlight is amazing! I have over a dozen small led flashlights and this is definitely my favorite one! Nicely made. Great flexibility. 1000 lumen output is awesome. I have been a long time user of maglite. the Quality of this Fenix surpasses anything from Mag. I love the recharge options, but will get an extra battery and charger soon just to have them on hand. I have been using this light for a few weeks now and can say this light is truly the best one I’ve ever owned. Its SUPER bright. I use it to light up c130 engines in the middle of the night and for inspecting the exterior and interior parts of aircraft in flight. It fits perfectly in the flashlight pocket on the A2CU flight suit. It hasn’t let me down and the battery life is great. Highly recommend it especially with the battery indicator and mode switch. Great build quality. Super bright. Great light. Very very bright! Easier to charge then the original. This is my second and I will get a third when the time comes! One bright little light. The rechargeable option is awesome. GREAT Light! The light is small & unobtrusive enough to carry everyday, yet has enough heft to it so you won’t forget you have it, nor will you be bothered by it. I LOVE the run time! I’ve had the light for about a month now & I use it countless times daily (mostly in either ECO or LOW modes) & have yet to charge the included battery after the initial charge. Also, I usually run it on medium for maybe 10 mins every night when I go to check the mail at my apartment complex. While that may not seem like a big deal, consider this: about 2 weeks ago a major storm knocked out power to my neighborhood for 6 hours. For most of those 6 hours I ran the light at LOW, but for about an hour & 20 mins it was on MED. Then I have to cycle through the brightness levels to return to the ECO or LOW setting before switching the light off so the light returns to that mode when I turn it back on. That happens at least 20 times per day. Yet to charge it; in fact, the Battery Level Indicator Light is still solid green. Solid & yet to flash even a single time. I’m more than impressed, I’m gonna buy another Fenix Light! This time the PD35, I think. There are two things that I dislike about the light. One is more of an annoyance, which is: the function button being the color that it is. When paired with the fact that there are similar indents all the way around the light at that spot makes finding the function button tedious to say the least. If it were a lighter color, like silver, or had a ring around it like the PD35, it would be much easier to locate. And Two: The tail switch button sits a bit to high & the boot seems like it will tear off after not too long. Probably the reason for including a spare rubber switch boot as a standard accessory, but only time will tell. The color temperature of the light takes some getting used to, but now that I am I don’t mind it. At first I really didn’t care for it, but I just had to adjust to it. The lanyard is great, nice & thick, and seems like it won’t be like practically every other lanyard (supplied w/ basically any product) & wear out after only a couple months with no stress put on it. Love this flashlight, use it every day for work and the different lighting modes and rechargeable feature are a huge bonus. Typically use the high and turbo modes but the 1 lumen option is extremely useful for low light instances where you don’t need more than that. Was a bit hesitant to buy at first but definitely don’t regret it all now, wish I had bought this sooner. Several coworkers have sparked interest in getting one for themselves for its small size but powerful output. Great Lights! Great Service! I’ve been a big fan of Fenix Lights ever since my brother purchased me their UC35 two years ago. Solid design, powerful light, easy recharge: I carry it almost everywhere. Would strongly recommend! Love the light, beautiful beam and fantastic tech in the lights. I went with both the uc35 and the pd35 and love them both even though they are so similar. Very fast shipping as well and would purchase again. LOVE the light… it works great! …. I realize you guys make flashlights and not the pouches…but the pooches just do not hold up… to flimsy and the velcro wire out in just a few short weeks so I had to purchase another brand and style…. Thanks for asking! It is my 2nd one, I perform real estate and home inspections and use it daily for hours on end. Got the 2nd one just to have a back up. Not an issue but if I had to chose I prefer the first version because the beam is just a little wider and that is better for what I am doing with it most of the time but if I didn’t have both versions I wouldn’t have known. This is my 3rd fenix, love these lights. I’ve got a PD35, a PD35 TAC, and now the UC35, my new EDC light. The power is even greater, the ability to recharge in the car from a USB phone cable, and functionally of the previous PD35s make this my go-to light for inspecting the interiors of the digital presses that I service in my occupation. When the day ends, it lights up the nights (and the woods) when walking around the yard or my neighborhood. Yea, when I walk through the valley of the Shadow of Death, I will fear no evil, for I shall light up the valley with my UC35…it is most awesome. Wow! I have a PD 35 tac and this UC 35 blows it away!! I highly recommend this product!! Thank you Fenix once again for a awesome product! Very compact, very bright and adjustable brightness. This is an outstanding light. I am a retired LEO, and I had the older version for the job, and post job. That one now stays in the truck. This newer model was purchased for the new job, for office and warehouse tasks. I’m supervising construction projects, and this light is a great upgrade to the old one. I also have to say that the older model might have had a slight voltage leak, because it seemed to deplete the charge over time. This model does not, it lasts a very long time on a charge. I also really like the charge status light in the mode button. USB charging convenience means you will always have a place to give it a quick charge, that is, if you could ever get this 3500 mAh battery to deplete! You can’t go wrong with Fenix, great quality. This one stays locked in my drawer when I’m not using it, because everyone has flashlight envy when they see it! Handy little flashlight that packs a punch. Long lasting battery that is easily recharged. Great product!!! Bought mine for use in corrections. Super bright! Love it and the ability to charge with USB. Only drawback is inability to adjust the beam. This flashlight is perfect for nighttime fishing. I clearly see the bank from my fishing boat.I’m please with the purchase and this tiny but powerful flashlight did exceed my expectations. Thanks Fenix! So far so good. I work in a paper mill so I need different levels of brightness wether it’s to go in a basement or to work on a pump or to get someone’s attention without blinding them I can choose the perfect brightness. It’s wet and dirty in a paper mill so the water and dust proof light is a big plus. Also the holster makes easy access and not weigh your pockets down and the lanyard attached so I won’t drop it into the paper machine and tear something up. Best thing is it’s rechargeable so no more buying and swapping out battery’s all the time. I will never go with a different light than a Fenix. I love the fact that I could change lumen outputs. I usually use the 150lumen brightness, but when the need arises for a brighter light, I can easily make it MUCH brighter. I have the previous model and this simply a great improvement on something that was already very very good. Smaller, but with the same build quality and an easy to read indicator on the charge level. I use this on my travels as I have had power go out on more than one instance and having a quality light is important. My dad taught me the importance of spending a bit more to get quality rather than having to replace over and over. In this case in an emergency, want something that I know is going to be reliable. Great flashlight, very bright. It took a little getting used to on using the bronze button on the top to switch between lighting modes and not the rubber button on the back. Sturdy light. Great output. The UC35 fits comfortably in your pocket. Mode button fell out and flashlight was replaced right away. I only had it for one week. Other flashlights on-off buttons did not last hope this one does. I do work in the trades and this is in my pocket everyday. So far I would recommend this to other people. Great light except for the second button. When I pull it out of my pocket I can’t find the button. Their is no reference on the body as to where the button is. That being said the tail button is fantastic! It’s easy to operate as it sticks out enough for my thumb to push. Love the flashlight. Very sturdily built, and extremely bright. Perfect upgrade. Beam is tight and battery lasts quite a while. Look forward to getting another one if they offer it Cerakoted. The UC35 V2.0 shipped and arrived very quickly after the purchase and has a look and feel of quality. The light worked as advertised right out of the box (after charging the battery, of course) and although I do not know how to measure the output (for comparison to the advertised specs) the beam is very sharp, bright and focused. I have not had the light long enough to attest to its durability. However, with Fenix’s reputation for customer service and ,support, I’m not going to be overly concerned. Excellent light for car, home or everyday carry. Great light throw for its size and the range of brightness meets all my needs. No better flashlight for the money along with great customer service and tech support– Thanks!! Absolutely amazing!! Brightest light I have ever used. 2nd purchase, and won’t be my last. Great flashlight and almost any application. Never without it! The flashlight exceeded my expectations, it is well constructed and very bright. I carry two of these when I’m on duty. Definitely would buy again. 60% reliable so far. It doesn’t always fire up when I press the on/off switch. I will rotate the crown and it lights up. Also, occasionally, the strobe works for only about 2 seconds then it shuts off until I once again rotate the crown. Not good. Wow, what a light. Works perfect, lights up the night. Very nice light. Well made and very powerful. Has several different light settings and also a strobe setting. Extremely bright on its highest setting and strobe setting. Very happy with the quality of this light. Would buy again. This is one of the best all around lights I’ve ever used to date – I work in LE and use it as my backup light – the 1,000 lumens is enough to use as a flood light & is excellent for building searches & room clearing. The mid-range lumens are excellent for vehicle/person searches. The 1 lumen is excellent for when I drop things in the car and have to find them on night-shift. In the off-time (I’m an avid outdoorsman) and this becomes a safety light on road trips and for anything outdoors related it can’t be beat. Again, the 1 lumen was a winning selling point for me because it is SOOO useful. Pros: Variable lumen outputs in well-thought-out increments. Cons: For all the Fenix Lights that have the rubber tail-button, WHY can they not design it so the button does NOT extend beyond the guard so it can be stood on it’s tail. Con’s: Probably my biggest complaint, though I really like the side switch – it’s a bit small and when working in the dark (duh) it’s difficult to locate. I think an improvement would be either a larger, easier to find button, or a permanently illuminated side switch so changing the brightness would not be a challenge. I have been using the original UC35 for a couple of years and absolutely love it! When I saw that V2.0 came out I jumped on it. The light is a bit more on the bright white side and is more of a focused beam compared to the original, but it still floods out very well. I’d recommend this light to anyone looking for something of quality and versatility. Love it and would buy again. Very bright! Great price for all these desirable features. Anxious to find out how well the charge lasts. I have had this light for about 1 month now and it has exceeded all of my expectations. With the choice of multiple light levels it is a light for every task. The best part is that I don’t need to order surefire batteries anymore. I put it on my helmet at work as a firefighter. It’s a great low profile light. It’s nice not feeling like I have a brick strapped to my head (weighing down my head tilting it to the side like I’m confused all the time) like most lights would. Very bright! Usually have to put it in the lowest mode so it doesn’t act like high beams in the fog when I encounter smoke. Be careful where you aim it! I once shined it in one my coworkers faces and he was blind for three whole days! I heard the light beam can actually reach Mars on a clear summer night. These are great flashlights. Super bright, and compact. My second one! So far, I love this little light! This Fenix UC35 V2.0 is my little handheld lightsaber against the darkness of the world. It is small and to easy to grasp, in case you need to quickly see what went bump in the night, or if you are taking Fido out for his nightly walk. It comes with a powerful lithium ion battery, which can be charged via a USB port near the crown of the light. There is a tailcap on/off switch, and a small round button, also near the crown, that makes changing between 4 different light settings, quick and easy. Don’t let this small light fool you, it has enough power to turn your immediate dark into daylight. It’s probably 4 to 5 times as powerful as other flaslights its size! The fit, finish, and quality craftsmanshp are all praiseworthy. I am happy with my new toy/tool, and I believe you will be too! This thing is great! Excellent build quality and materials. Rediculous amount of light from such a small package. I also have the older UC40UE 900 lumen. This model is noticeably brighter and more convenient with the tail cap on/off switch. Highly reminded Fenix products to everyone I know. Absolute top notch flashlights, you won’t be disappointed. This is my every day carry, but I like it so much, I had to buy a second! Nice light, convenient operation and throws a little or a lot of light depending on what I require. Kickass light! I bring this thing everywhere with me, great job Fenix! Customer service also gets an A+. Another great Fenix light! I own the LD01, PD32UE, PD35Tac, and now UC35. UC35 V2,0 is slick looking, easy to operate, and love the recharge ability. 5 stars all the way. The original UC35 was a great light, but it had one major flaw. When you charged the light you had to click the switch to activate charging. If you forgot to click the tail-switch after plugging in micro-usb then it would not begin to charge. Over the time I owned the original, I must have forgotten to do that a 100 times and was furious the next day when it wasn’t charged for work. THIS LIGHT FIXED THAT! Just plug the light in and it begins charging just like anything else I own that recharges. Thank you, thank you, thank you! It’s good to know that others had issues with this also and forced this improvement. Bottomline- If you owned the original, there is enough here to love that you should consider the upgrade and pass the original on to your favorite relative. They will love that you are providing them a high performance light and you will have an improved product that is still what your accustomed to using. If you have never owned this light, then what are you waiting for! Get it now.